Literature belongs to all those who live and dream. 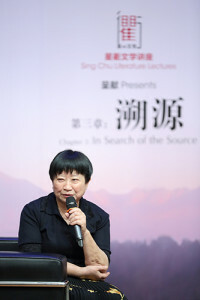 Through Sing Chu Literature Lectures, Chou Sing Chu Foundation regularly invites outstanding individuals from the Chinese literary community to share their journeys with literature lovers. We hope that these masters of literature can reach out to the public and inspire all to continue making literature an essential part of their lives. Jin Yucheng, formerly Jin Shushu, was born in Shanghai. His family is descended from Lilizhen, Wujiang District. 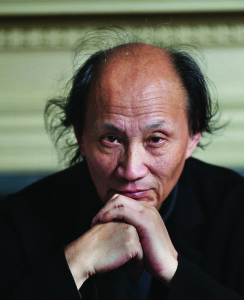 He is the editor-in-chief of Shanghai Literature. He began his literary career in 1985. His notable works include Light Chill, Square Island, The Age of Card Shuffling, Bowl, Blossoms, and Looking Back. 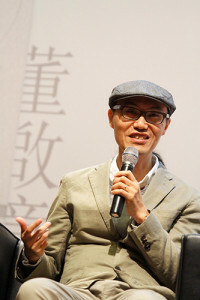 He has won numerous prestigious literary awards, including the Mao Dun Literature Prize, Lu Xun Literature Prize, Shi Naian Literature Prize, and the Taipei International Book Exhibition Prize. I have always known that readers are smarter than writers. When everything is written clearly, oftentimes it does not make for good reading; clarity may become a shortcoming instead. Leaving some blank spaces may be more meaningful, for the world is full of ambiguity. This will always be the theme of writing, the reflection of the complex human condition. No amount of additional information can untangle the true circumstances between people. This is literature in its truest form. Simply put, there are only two defining qualities of people: they will do everything to pry into others’ private affairs, but will do everything to protect their own secrets. 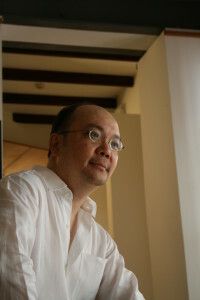 Singaporean architect Tan Kay Ngee graduated from the Architectural Association School of Architecture in London in 1984. He has received numerous awards, including the Singapore President’s Design Award and the Venice Biennale Silver Award. Kay Ngee Tan Architects was one of five architectural firms from around the world recommended in the November 2015 issue of Monocle. His notable projects include Singapore Management University and Commune by the Great Wall. He has also written several essays on culture and authored several books. Fans of renowned author, Jin Yucheng, don’t miss this! Bring along any book by Jin Yucheng from your personal collection to enjoy complimentary access* to the talk! Register now as only the first 50 respondents will qualify. – Limited to first 50 pax only. – Limited to ONE ticket per book per pax. – Confirmation email will be sent to those who have successfully registered for the event. – Successful respondents are to head to the registration counter on event day with Jin Yucheng’s book to obtain their complimentary entrance ticket. – Only Jin Yucheng’s books from respondents’ personal collection will be applicable for complimentary access to the talk. Library books will not be accepted. Titled “Time, Space, and the Human World—Poetry and the Everyday”, Chapter 4 of Sing Chu Literature Lectures featured Xiang Yang, renowned Taiwanese poet and a professor at the National Taipei University of Education Graduate School of Taiwanese Culture. Chang Show-foong, renowned Taiwanese author, brought readers in Singapore on a search for the source of Chinese culture and used everyday events to illustrate the wonders of life in this boundless world. 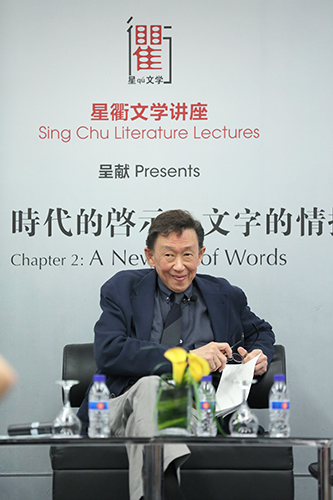 Renowned author Tung Chiao, in his first ever overseas public lecture, shared his thoughts on “A New Era of Words” of confronting the challenges of the new Internet-era media as a writer and a journalist, providing much food for thought for his Singapore audience. 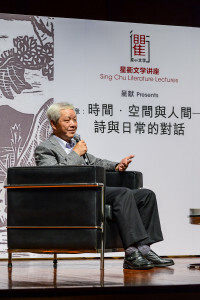 As a passionate and dedicated literature lover, prominent novelist Dung Kai Cheung shared his experience of “Literature, Life and the Times” in Hong Kong with the literary fans in Singapore whilst kicking off the exciting first chapter of the Sing Chu Literature Lectures.